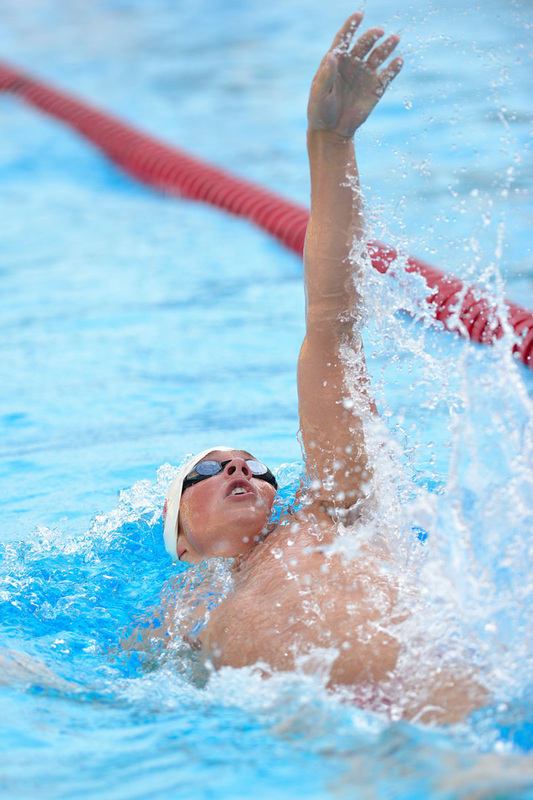 In the 2015 Pac-12 Swimming and Diving Championships, hosted at Weyerhaeuser King County Aquatic Center in Washington, Stanford’s men’s swimming finished a close second to USC, which beat the Cardinal 818.5-809.5 for the title. Although the Cardinal and the Trojans were neck-and-neck for first, USC won the 400-yard freestyle relay finale, which secured them the title over Stanford, Cal, Arizona, Arizona State and Utah, in order of finish. The Cardinal ended the first day of competition, Wednesday, in third place with a total of 66 points, trailing USC and Cal. Although Stanford came in third in the 200-yard medley relay, Stanford’s relay units attained a pair of NCAA A-cuts to begin the series. Patrick Conaton’s 1:40.48 in the 200-yard backstroke — which was four seconds faster than his previous record — was a lifetime-best for the freshman and earned him an A-cut as well. In addition, for a NCAA B-cut, freshman Peter Arnet dropped about a second and a half from his previous best in the 100-yard freestyle. On the meet’s second day, the Cardinal surged to first with a total of 288 points. The story of the night came when senior David Nolan broke school, league, NCAA, U.S. Open and American records in the 200-yard individual medley. Nolan succeeded in a performance better that of American record-holder Ryan Lochte, who achieved the time of 1:40.08 at the 2007 Winter Nationals. With four titles on his shoulders, Nolan is the only swimmer in Pac-12 history to win an event four times. Stanford’s Liam Egan, Curtis Ogren and Sam Perry each qualified for NCAAs as freshmen on Thursday, and were joined by upperclassmen Danny Thomson and Tom Kremer. On Friday, the Cardinal fared as strong as, if not stronger than, they had on Thursday, holding first with 564.4 points. Adding to the number of records set, in the prelims freshman Curtis Ogren finished the 400-yard individual medley in 3:41.23, a school benchmark, before taking second with an NCAA A-cut 3:41.32. Ogren’s efforts were complimented by sophomore Max Williamson (3:46.63, sixth) and junior Danny Thomson (3:48.05, eighth). Going into Saturday, Stanford led the six-man field, but in the final session, USC pulled an upset by scoring 287 points and won its first title since 1979, marking the first time a school other than Stanford or Cal won the Pac-12 meet in 36 years. The Trojans took the lead in the meet’s final race — the 400 free relay — with 2:49.50, which was enough to give USC a three-point lead. The Cardinal finished second for the third straight season. Still, Thomson (14:50.19) secured the win in the 1,650 free, and Nolan (1:40.02) took silver in the 200-yard backstroke. The NCAA Zone E Diving Championships will take place in Colorado Springs, Colorado from March 9 to March 11. Stanford will then travel to Iowa City, Iowa to compete in the NCAA Championships from March 26 to March 28.